For only $49 /month (no extra fees), your mobile customer engagement and loyalty app will help you to convert more service and sales opportunities, increase loyalty & referrals, and win more competitive deals. 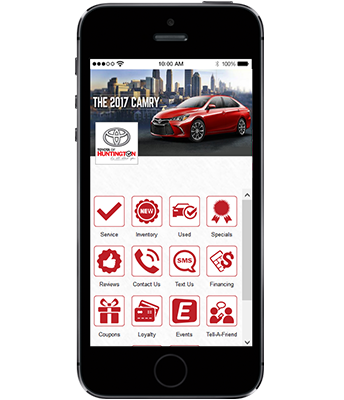 Schedule Service – increase service appointments by digitally prompting and reminding customers. Inventory – promote and sell inventory, parts, specials, body shop and rental services. Mobile Offers – sell more services and increase customer spend with compelling offers i.e. oil change, brake service, tune up, etc. Live Chat – improve satisfaction and convert more opportunities by allowing customers to chat with the sales team. Push Notifications – send geo-targeted pop-up alerts i.e. specials, new inventory, service reminder, events, etc. Loyalty Program – reward customers for frequent purchases i.e. oil changes. Events – promote pop-up and special events. Financing – enable prospects to inquire and apply for car loan or lease. Online Reviews – increase reviews by digitally prompting customers to easily leave a review. Dynamic Back End Solution – web-based management system includes two-way staff and customer messaging and alerts, content and graphics management, and account management. Analytics – measure ROI with detailed reports on user downloads, user activity, offer redemption, etc. Compatible with iPhones, iPads, Android smartphones and tablets. Pricing – at only $49 /month Zuzapp delivers the best value in the market with no set up fees, no hidden fees, no extra fees, no surprises. Check out our happy customers. Request a 10 minute demo today!